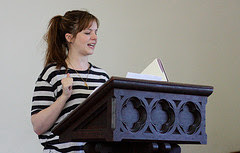 No, The Sisterhood of the Traveling Pants and House actress Amber Tamblyn is not scheduling a trip to Miller Memorial Library, but she is a published poet. You can find one of her collections, Free Stallion in the Young Adult area of Miller Library. Amber Tamblyn was born and raised in Venice, California and is a 3rd generation Californian. She has been a writer and actress since the age of 9. She has been nominated for an Emmy, Golden Globe and Independent Spirit Award for her work in television and film. In 2007 she won the Berlin Film Festival award for Best Actress for “Stephanie Daley”, in which starred opposite actress Tilda Swinton... Amber is most recognized for her work as Joan on the CBS television program “Joan of Arcadia”. Tamblyn is also one of many writers for Blog: Harriet, a feature on The Poetry Foundation's website. The Poetry Foundation is a 501 (c)(3) foundation and the publisher of the oldest monthly publication dedicated to poetry. The above photo was taken by T. Carrigan onMay 16, 2010, and found here, through Flickr. It is protected by a Creative Commons copyright license.